CNC machined 6061-T6 aluminum suspension links (dogbones) for lowering or raising the rear of 2006 or 2007 Kawasaki KLX250S. 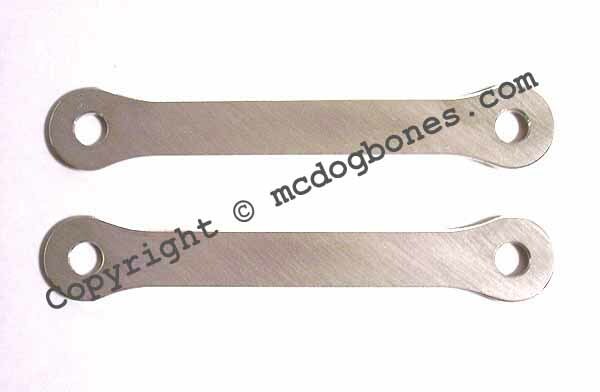 Use these dogbones to lower your KLX250 when you find it just a bit hard to touch the ground well or to fit your desire. Keep in mind that it will reduce ground clearance. Or choose the raising links to raise (jack up) the rear for better handling or more ground clearance. These dog bones are MADE IN USA. Available in +13/16"(2cm), stock length, -1" (2.5cm), -1.5" (3.8cm), -2" (5.1cm), -2.5" (6.4cm), and -3" (7.6cm). Select your size from the dropdown. Sold as a pair for listed price.